Warmafloor, a leading provider of underfloor heating and cooling systems, has launched a new control system – Sentio. Manufactured using high quality components from Warmafloor’s parent company, Wavin – Sentio has been designed to take complexity out of temperature control. The company believes that the thermostat’s minimalist interface makes it one of the most intuitive and visually attractive on the market. It has built-in app control software so users can also use their phone to manage the system. Additional features include in-built humidity sensing and dew-point detection. 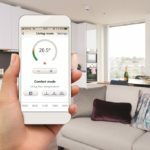 The Sentio product family includes the Central Control Unit (CCU), extension units, room thermostats and sensors – available as wired and wireless – an app and a commissioning LCD touch screen that is removed once installed.